In parties, gatherings, or any kind of event, the number of people in attendance may either be more or less than what is actually expected if there are no invitation method used by the event planners. To make things clearer, an event will be attended by an excessive people since there is a lack of distinguishing the actual attendees from the event crashers. On the other hand, there will hardly be any people in attendance when invitations are not used since the expected attendees were not formally informed regarding the event. For your convenience, we have here a collection of formal invitation card designs that are all vintage-inspired. Between modern designs and vintage ones, the latter are usually more meaningful since it reminds us of how invitations were made in the past which took a lot more effort than the ones today. 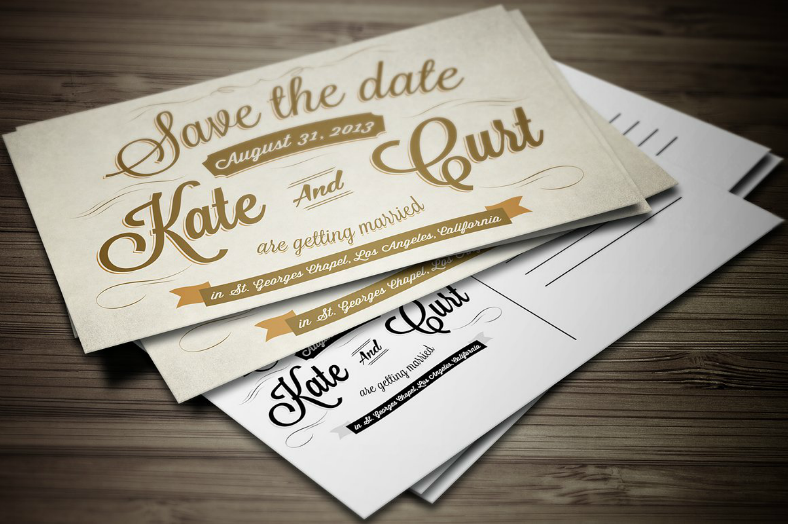 Back in the days, invitation cards were mostly hand drawn and handwritten, whereas today’s invitation card are easily designed and printed on computers. Feel free to check out the different vintage invitation card designs below, and you might find the particular one that you want to use for your event. 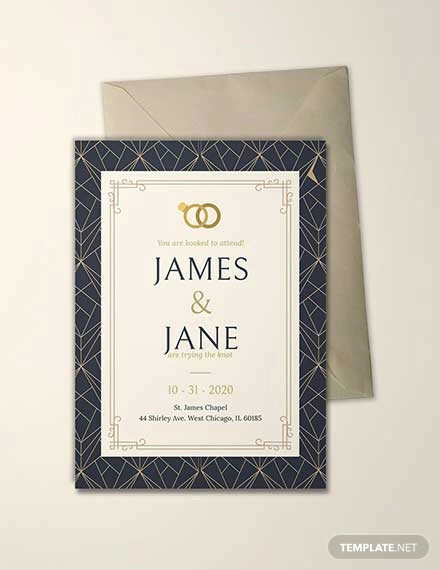 Check out the sample invitation card shown above, which shows us two color schemes of the same design, but if you click on the button above, you can see on their site that there are actually four colors to choose from. Since this invitation design isn’t directed to a particular type of event, you may want to use this design for weddings, Christmas parties, anniversaries, or birthdays. And if you look closely at the bottom portion of the design, you may see that there is an indication for an RSVP, but instead of letting the recipient write their response and send back the card, they will only need to contact the number provided to confirm their attendance on the event. For this invitation design, you may say that it has both modern and vintage features which works very well and are able to compliment each other on the design. The middle area of the design has been kept neat and free of any graphics to put the reader’s focus on the written text, and this white space is enclosed in a simple line border. Outside that border is where you can find the abstract leaf and flower patterns to enhance the quality of the invitation card. 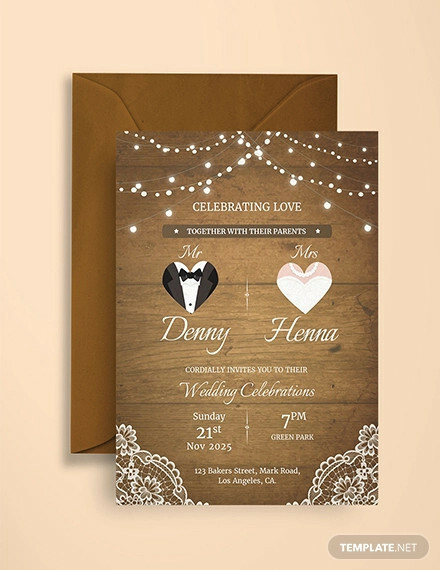 So if you are planning on getting married, or are helping a family member or friend plan their wedding, we would encourage you to download this very attractive wedding invitation card design. 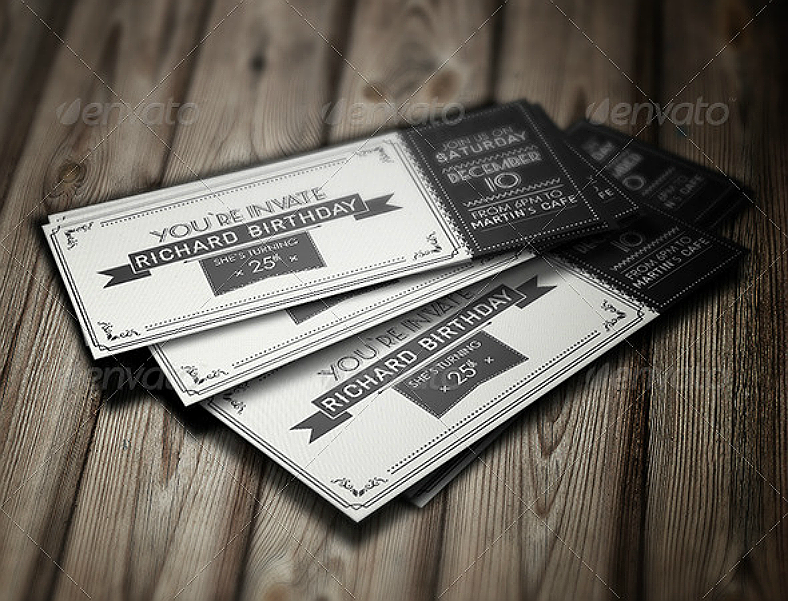 Here’s another creative birthday invitation design, which got its idea from coupons or tickets. 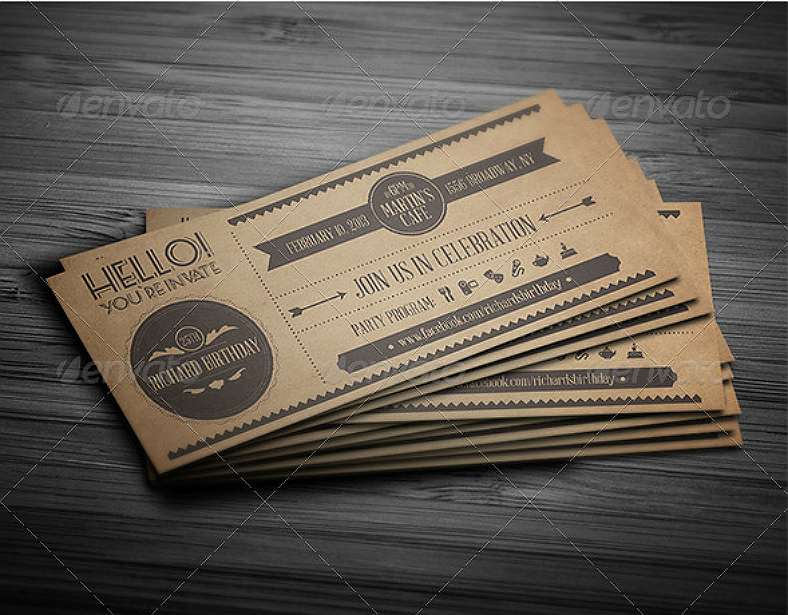 To make things interesting, you may use this design as a coupon by using the bigger half of the invitation as an RSVP card and ask the invitee to return it with their response, and have them keep the smaller half to be used during the actual event as a requirement before they can enter the premises. Another way that you can use this design is to use it as a ticket and simply ask for it during the event, tear off the bigger half and return to them the other one as a form of souvenir. Don’t just use this as a boring invitation tool, stimulate your creative juices and make this invitation design as interesting as you can to make it memorable for your guests and yourself as well. For those who wish to make their invitation card relevant even after the event itself, here is an ideal design for them. This ceremony invitation card doubles as a post card which can be used by the invitee to write down a personal message on the rear side of the card and addressed back to the host. Using this design, you may be able to relive those precious moments you had during the party by simply reading through the messages written on the invitation post cards. When using this invitation design, just make sure to inform and encourage your attendees that they may be able to use the rear side of the invitation card to write a personalized message. 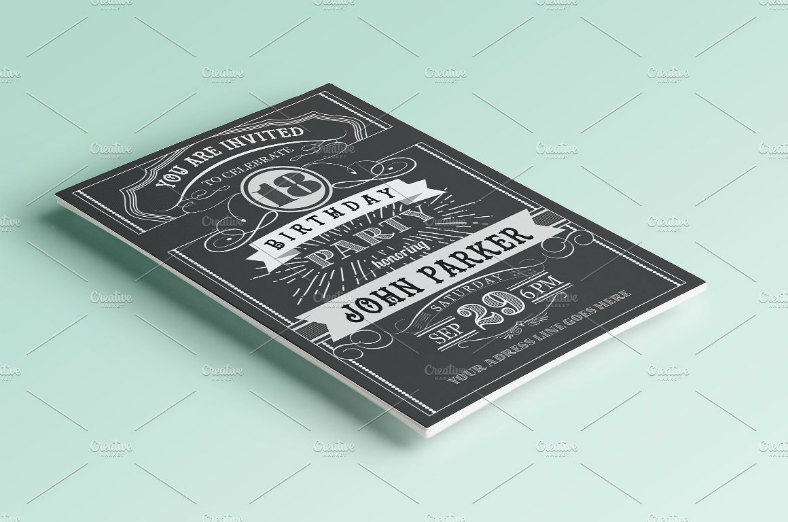 If you are into ornate designs and borders, then this party invitation design may be the one for you. 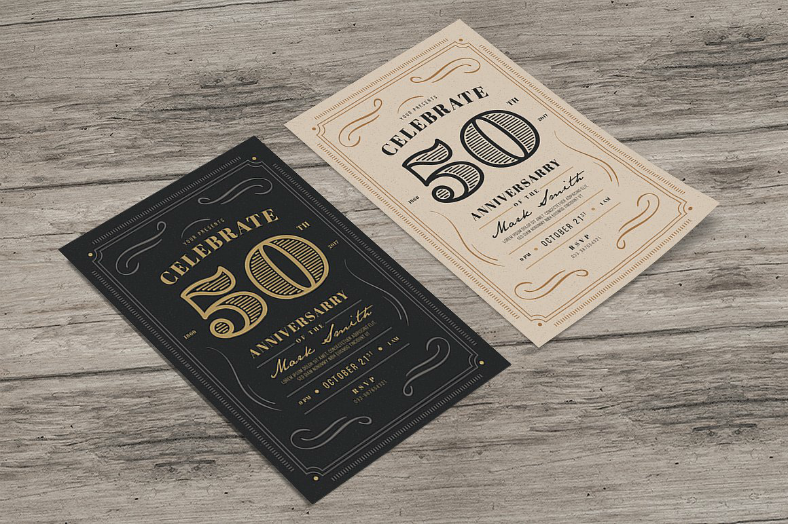 While the main focus of the invitation design is the number in the middle which signifies the number of years the celebrating couple has been married – and in this case, is the couple’s 50th year – the ornate decors surrounding the text effectively helps in making enhancements to the invitation card. With this design, you can choose between two color schemes, which is basically between a light and dark theme, but regardless of which one you opt to use for your event, rest assured that your invitation card will still look visually attractive. If you need some inspiration, you may refer to our list of awesome anniversary invitation ideas. 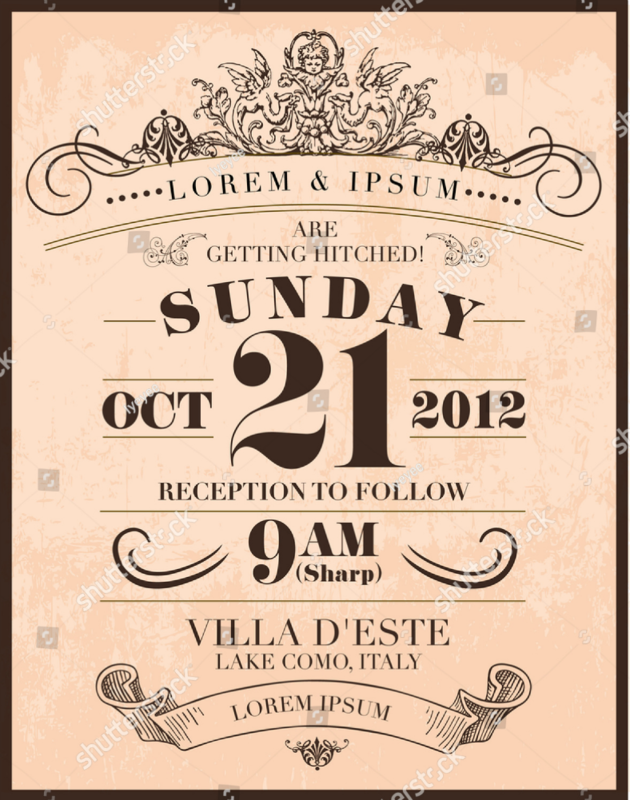 Take a look at the vintage wedding invitation design above, you can determine that aside from simply printing it out as an invitation card, the design is also be used to make flyers, or even posters. The way the design is made, with the bold typography in the middle portion, the abstract decors on top, and the ribbon image on the bottom, it really resembles vintage advertisement tools that were commonly used in the past. 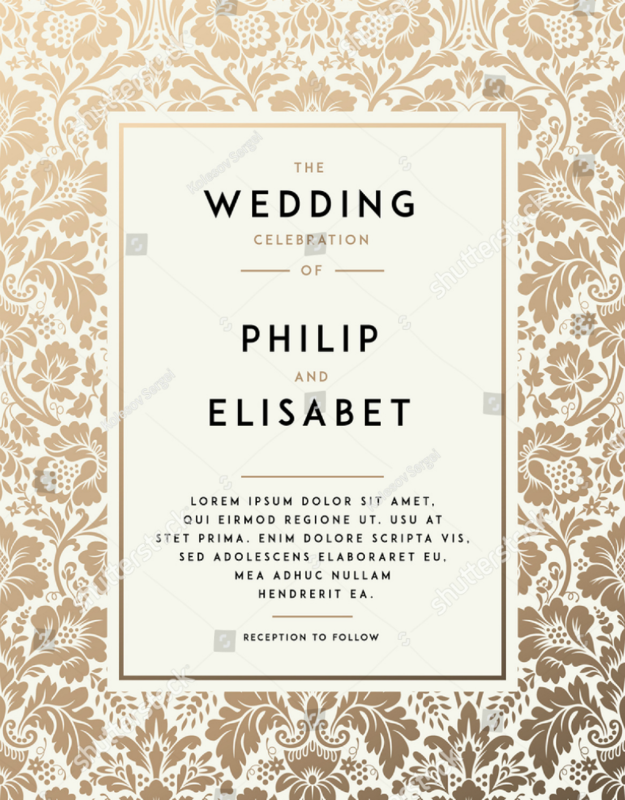 While the sample above shows us the invitation being used for a wedding ceremony, you may be able to use this design for other purposes as well, which includes anniversaries, birthday, or you may even use this as a graduation party invitation. One minor feature on this invitation design that really helps in making it appear genuinely vintage is the textured background, which makes the paper look old. 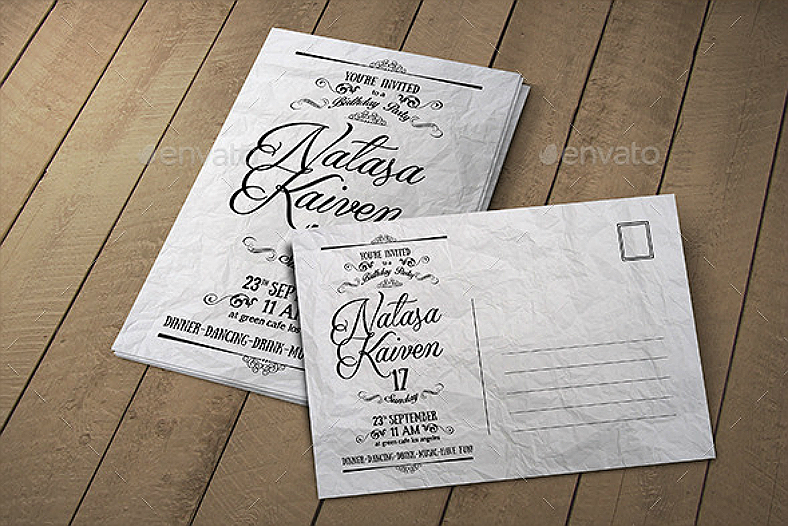 If you think this invitation design is perfect for you, then don’t hesitate to download it. To really put emphasis on the importance of invitations, every event – whether it is large or small, or formal or casual – should always make use of invitations to let people know that they have been sincerely expected by the host to attend the said event. 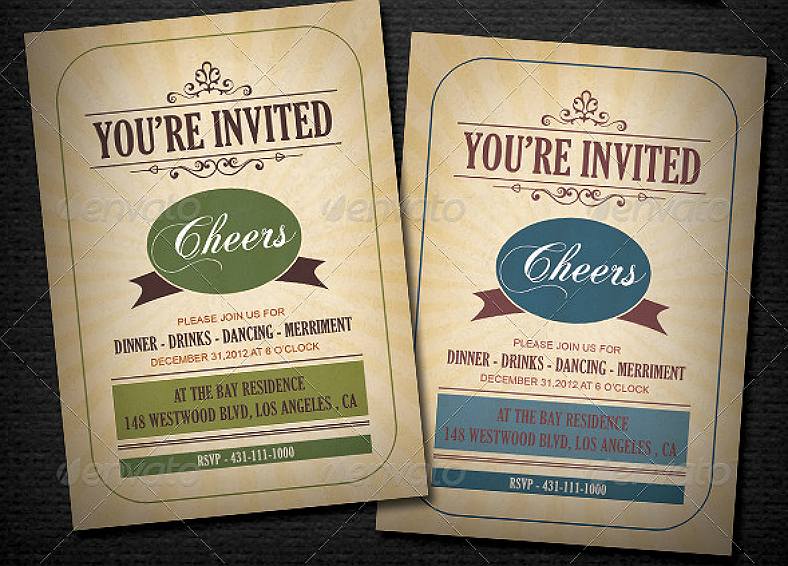 As you have seen from the samples shown above, you can have these invitation designs printed in any form you like. You may want to make these as flyers, post cards, or just regular cards, what’s important is that it can still serve its purpose of informing the recipient regarding the event and letting them know that they have been invited. These event invitation designs have been gathered from multiple reliable sources, which houses hundreds of the best designs that you can ever find on the internet. These designs were also created by very talented and inventive graphic artists from all over the world, who wish to provide people with exceptionally attractive vintage invitation card designs. As long as you have a stable internet connection, you may be able to download these designs easily, but doing so may require you to pay a small and reasonable fee. As for the editability of these designs, you can do as much alterations or modifications as possible since these are in vector format, and as long as you have the required editing tool – most preferably Adobe Illustrator – you may be able to edit these designs easily.